Although I am no expert, my understanding is that the term “pippin” is a generic term for apple because apples are not true to their seed. The only way to get a specific kind of apple is to graft it onto some other stock I believe. But I do know that pippin is not a kind of apple, as for example honey crisp is. It can be any kind of apple. I think your receipt just wants you to use local apples. Although I have always made the choice that you made and done all of my frying in vegetable oil, I am told by the expert bakers that at least once in your life, you should have doughnuts that have been fried in lard. The same may be true of apple fritters. Mercy, these are great thoughts, as always. Some UK apple producers sell certain varieties as “pippins” or “[NAME] Pippin” so I wanted to be clear about what we chose to do. Next time I’ll have to use lard! Pippin apples are a cultivar. Many orchards like North Star Orchards( near Gap PA) grow and offer a variety of Pippins, as well as some 350 varieties of apples not commonly grown. Mixing cream and wine; using some bread along with flour – sounds interesting. The bread would have contained some flour and some leavening? Would any leavening in the bread have any effect in the apple fritter batter because you know I’m wondering why grated bread? I’m asking because I’m guessing if you didn’t have old bread, you could just throw in some extra flour and wondered if you’d then need to add some leavening. I know you’ve halved the recipe so what was the reasoning behind using 1 cup cream instead of 1/2? Did 1 cup cream to 4 eggs instead of 8 eggs make the batter too thin? So “cofe” means 1/3 or 1/3 cup? Yes, it sounds like the apples are best eaten quickly after cooking but did your leftovers get soggy and/or greasy? It’s fascinating to see how vocabulary and spelling have changed over the last several hundred years. They’ve changed somewhat in my lifetime and I wonder what people will think about our vocabulary and spelling several hundred years in the future. Love the blog and thank you. Lots of interesting questions! I’m going to try to address all of them. Leavening – There is no leavening in this recipe! 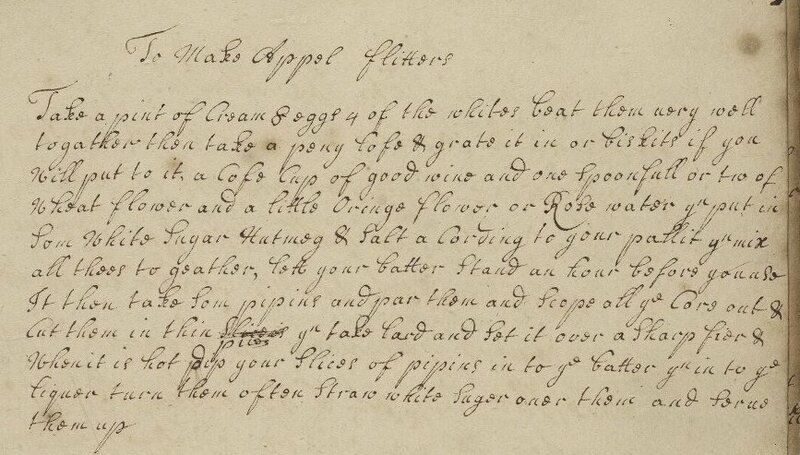 Early modern recipes are normally leavened with yeast or whipped eggs and this has neither. The choice of bread or biscuits would have no effect on this. Cream – The original recipe calls for a pint so I include 1/2 a pint or one cup. The batter was manageable with these proportions. “Cofe” cup – “Cofe” means Coffee! These were the early days of drinking coffee in England. Alyssa and I were not sure about the exact volume of an eighteenth-centry coffee cup, so we approximated here and estimated that a full coffee cup would be about 2/3 c, hence 1/3 c halved. Leftovers – The leftover fritters got soggy and greasy.